With their latest program ”SECRET PLACES” the Twiolins invite the audience to a journey of discovery of hidden places deep inside their imagination. Pulsating rhythms of the Balkan dance in fog covered rocky landscapes, breath and light come to new life, a dancing and seducing ballerina battles the distorted sounds of rock. With two violins, the two siblings create suspenseful and contrasting worlds and balance innovative musical language and soothing harmony. They mesmerize the audience into a deep trance until time and space stand still. Individual raindrops become the source of mindfulness, revealing the inner worlds of our soul. Like an epochal musical setting of the “Storm and Urge” of the 21st century, the ride of the young poet Schiller through the German forest, sounds harmonically dense and inescapable. Wild beating cascades of emotion keep the audience mesmerized until the inevitable end. To explore new dimensions of music, the Twiolins initiated a composition competition held every three years. With daring combinations of sounds, beguiling melodies, or insane virtuosity, composers from around the world compete against each other and must win over the toughest jury, the audience. So far, over 500 composers from 55 Nations took part in the crossover composition award. The winner’s works of 2015 are presented in the program “SECRET PLACES”. 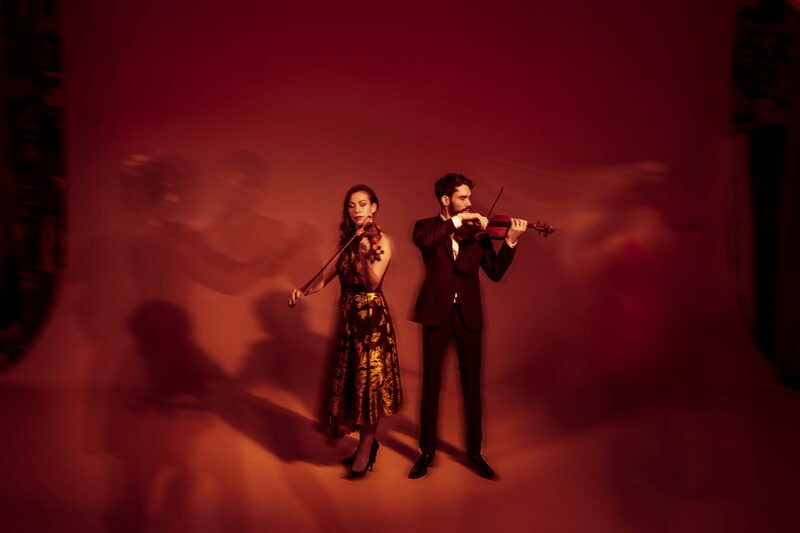 After playing all the repertoire for two violins since they started their career, The Twiolins were looking for a new project. So it was only natural to have a look into their childhood, where they were impressed by the godfather of violin, Gidon Kremer. His interpretation of classical music but also the Tangos of Astor Piazzolla was the music at their home when they started to play the great pieces by their own. So it felt good to the siblings to adopt Kremer´s project „Eight seasons“ and transform it into a typical Twiolins project. To reduce the Four Seasons by Vivaldi for two violins was a risky adventure, but worth every note Christoph arranged – Arranging the music by himself was the only solution in his eyes after years of playing violin duos with his sister. Knowing the do´s and don’t´s of his ensemble he found the most beautiful version of this great masterpiece. After finishing the Four Seasons by Vivaldi the next task was to find the right music from Piazzolla for the two violins and after a little while of research he invited the viola to their ensemble to accomplish the feeling, the heat and the dance of Buenos Aires and to bring it to the concert halls. 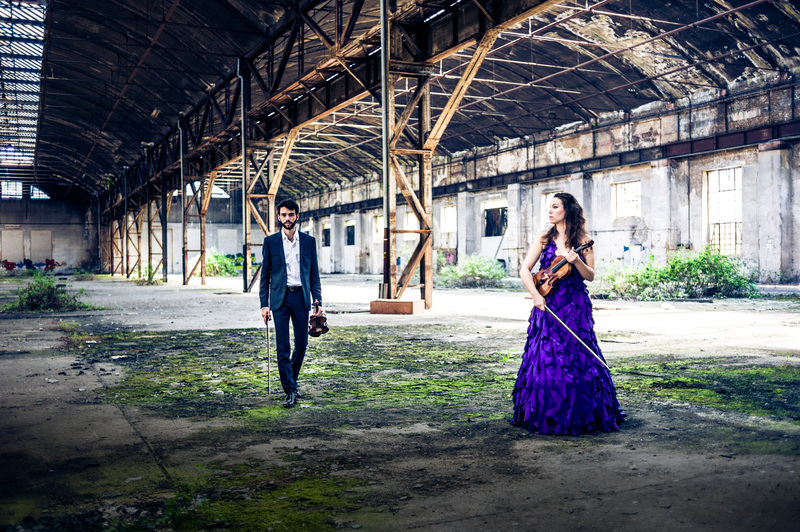 The music of Vivaldi and Piazzolla takes the listener on a musical journey across two centuries and two hemispheres. It is a project in which the borders between musical genres, continents and centuries, are eliminated, and what endures is the consistent quality of the works themselves. For The Twiolins, siblings, raised in the classical tradition, but after finishing their academic studies always pushing the boundaries of musical genres, their common language is a musical one. 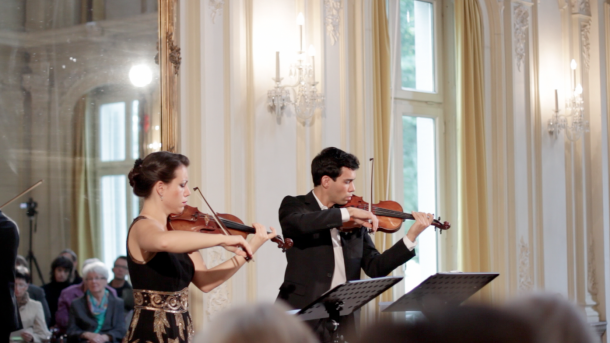 The ensemble´s performance breathes new life into Vivaldi´s work without compromising its essence, and introduces audiences to Piazzolla´s lesser known and eminently worthy compositions. Robeat is one of the world‘s most talented beatboxers and is the reigning European champion. For years, he’s been a large presence in the event and gala area, and has been impressing in TV and film. The 28 year old prodigy leaves audiences speechless time and time again. As a “human beatbox” – meaning he’s only equipped with his microphone and voice – he demonstrates the artistry of mouth acrobatics. His unmistakable style, consisting of hard technobeats, fast drum-and-bass rhythms and mellow Hip-Hop sounds, is combined with his foray into singing and comedy. When The Twiolins and Robeat go on stage together, two completely different ways of making music collide, but are combined in a beautiful and expressive way to blast the audience. Soothing violin sounds are supported by powerful beats, mouth acrobatics and special effects to create new colors in the musical stories The Twiolins tell. 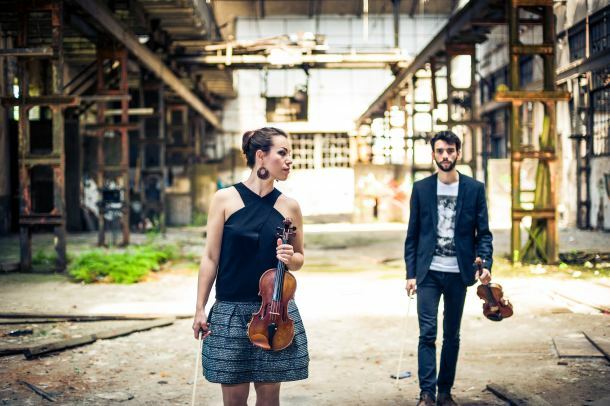 The show Robeat meets The Twiolins connects the diversities between urban culture music and classical music in its best way and opens these two traditions to new audiences of all ages. In 2013 The Twiolins and Robeat had their first concert together in Mallorca and since then they continuously share the stage and are connected in a musical friendship. 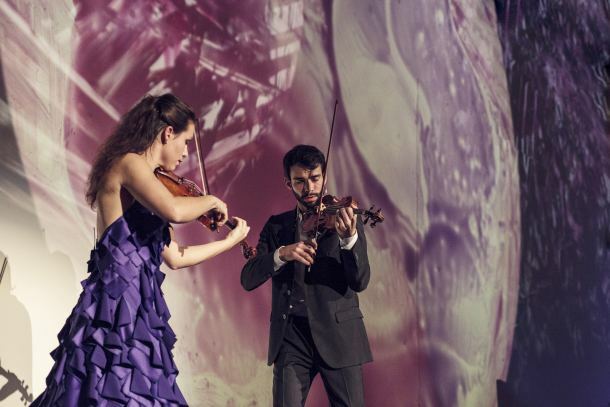 Spark, the Classical Band – one of the most talked about formations on the international young classical scene – meets the famous violin duo The Twiolins. This is a summit of classic revolutionaries, full of surprises, exciting sounds and the passion of a new generation of interpreters. With radically new approaches to the classical tradition, both ensembles have brought fresh air into the chamber music world. In this joint concert, they show the whole spectrum of both ensembles – with new compositions created for each of them and for both groups together. Spark was founded in 2007 and quickly became one of the most promising German classical music acts. With their ear for the unusual and the unheard, these five young musicians move effortlessly between the most contrasting musical worlds, celebrating an eccentric mix of classical masterpieces, minimalist music and avant-garde. In 2011, the Classical Band received an ECHO Klassik Award in the category “Classics without Borders” for their debut album Downtown Illusions. The Twiolins revolutionize the classical and chamber music world with their `progressive classical music´. With the program SUNFIRE they drive into musical parallel worlds, chase the emotions of the audience to the most extreme levels, enraptured between captivating beautiful sounds and rhythmical pulsating structures. A sunrise, from the tentative dawn to the glittering light at the horizon – the journey on eight string starts with that expressive sound – fantasie. It continues with an old steam train, beautiful landscapes, wistfully melodies and cheeky flies. The british “sonnet nr 5” needs full body commitment, frazzled bow hair and Shakespeare-Rap. With a racy highway ride and a trip to the space, nothing is missing in this musical journey around the world. SUNFIRE presents the winner´s works of the Crossover Composition Award 2012. The Twiolins – CD Release "Sunfire"
You will travel through the centuries and visit selected stations of the unique genre violinduo. Starting with the special lightness of french baroque, through the virtuosic joy of Luigi Tomasini, going on the feastful romanticism of Charles Dancla up to the peak of modern music with the big Sonata of Sergej Prokoview. At the end a shaman firework of two chasing ghosts, rising in glaring hights and devil rhythms up to their explosion and their vanishing. Not only in the modern age there are wonders of virtuosic violinduos, but also in the age of classical music. For many years the Twiolins collectet treasures, searching in different archives, libraries und publishing companies, and now they present the most interesting parts of it. For example the duos of Luigi Tomasini and Ferdinand Fränzl: Only the Twiolins have these pieces in their repertoire. Luigi Tomasini, youngest violinist at the Castle of Esterhazy, raised soon the position of the principal player and became good friend and student of Joseph Haydn. True to his musical roots his work represents the most artificial way of virtuosic violin art of the italien style. Ferdinand Fränzl, son of the famous Ignaz Fränzl, is third generation of „Mannheimer Schule“ and thereby sort of written for the Twiolins, who studied music in Mannheim and chose to live there. Written in the style of early romanticism, his music tells like an opera big emotions, doesn´t skyp any technical finesse and ends in an furioso finale, exciting up to the last tone, like Paganini for two violins. Twiolins – Programm "Virtuos, elegant – klassisch"